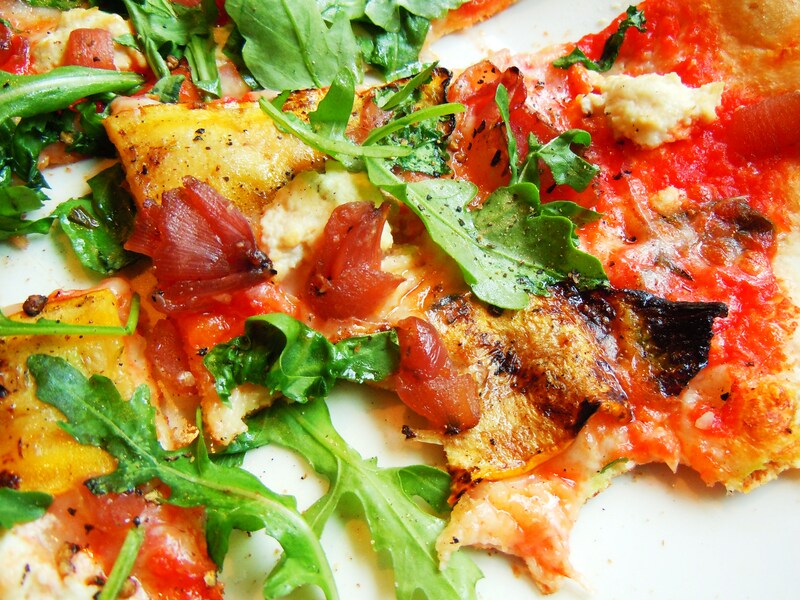 Grilled Zucchini, Fresh Arugula, & Amazing Pizza Crust – Eaton Centre’s Trattoria Mercatto, Part II! 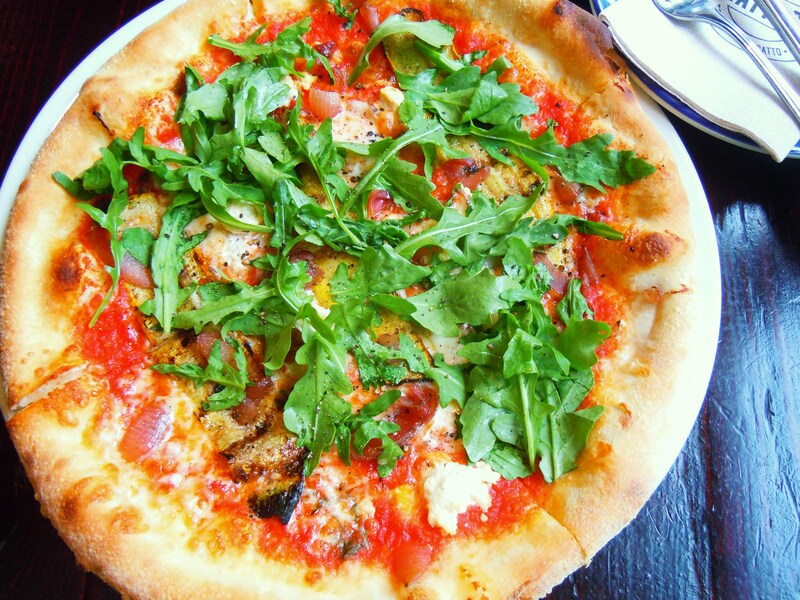 Calling all pizza lovers: Trattoria Mercatto, Toronto Eaton Centre’s resident Italian eatery and wine bar, is THE place to be! I know we all have our favourite pizza takeout place. The one we fall back on when we want to cozy up on the couch with the remote in front of the tv munching on pizza in our jammies or sweats. But let me tell you, when you feel like dining out for the wood-fired oven goodness with some wine, a few good appetizers, and a sweet dessert to end the meal, you want the super good stuff and I am over the moon that I can say that Trattoria Mercatto has the stuff pizza dreams are made of. You might be thinking, “wow, that’s quite the proclamation!” After all, there are many places in the city that serve pizza. I haven’t tried them all (and I don’t think I ever will! ), but I have tried my fair share and I can tell when I’ve come across something average, something good, and something fan-freakin’-tastic. I mean serious business. When I eat food that is tripping over the line of amazing, it deserves several good hooplas and cartwheels and in this case, a very happy blog post! This even takes me by surprise. I’ve always been wary of restaurants in malls. When I was in high school and university, my friends and I would go to them more so out of convenience than anything else. And while I’ve never had anything awful, I’ve also never had anything memorable. 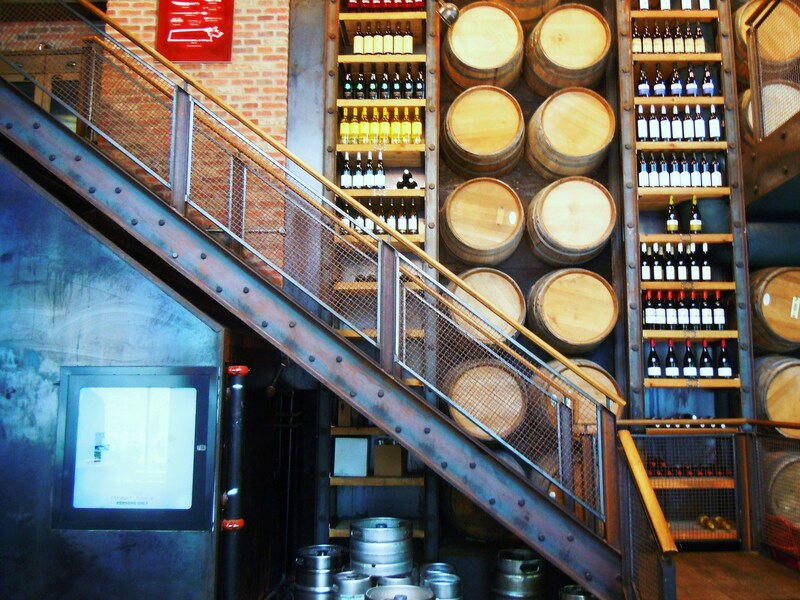 Mall restaurants conjure up feelings of bland, ho-hum, and ordinary. There’s no excitement, no real creativity in it for me. 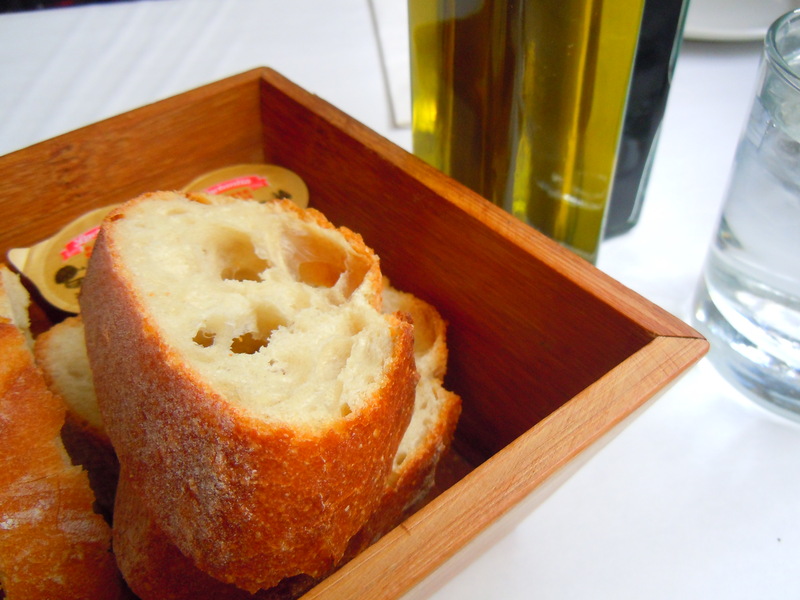 But I wanted to give Trattoria Mercatto a chance. For starters, it’s located inside my favourite mall. 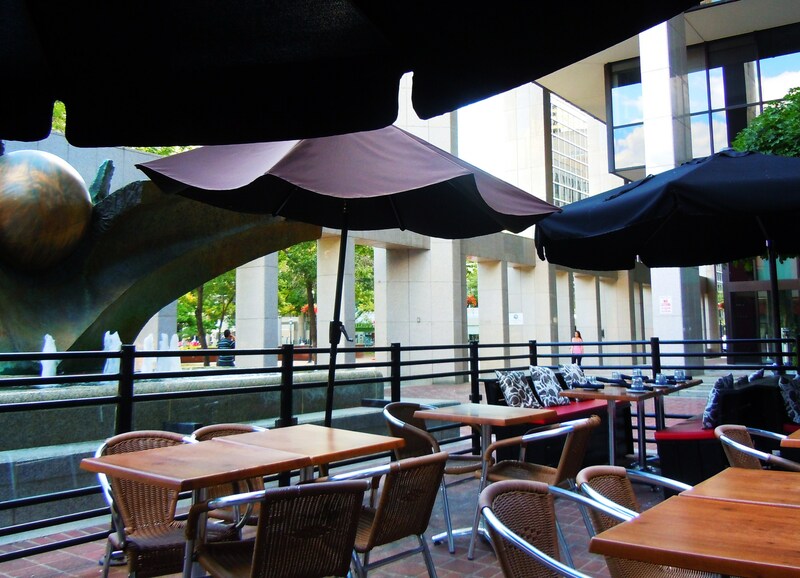 Second, it’s pretty, fresh, and airy on the inside with a nice outdoor patio overlooking the park by Dundas and Bay. Third, my best friend had gone before me and reported back saying she enjoyed it so I knew it had to be good because I trust her judgment and between the two of us, she’s definitely more critical. And finally, it’s Italian and I never say no to Italian. Trattoria Mercatto hasn’t been a long-time fixture in the Eaton Centre, but it’s been there long enough to impress, so I knew it was only a matter of time before I caved and went. And oh my god was this first visit one of the most terrific lunches ever. Their regular daily menu is comprised of antipasti and salads (ricotta and Italian speck crostini, Sicilian fried cauliflower, beet and arugula salad with Italian burrata cheese), Italian panini sandwiches, (mortadella, prosciutto, artichoke pesto, fior di latte cheese), Italian cheese boards, lots of Italian pasta dishes (orecchiette, bucatini, ravioli, pappardelle, and more with sausages, cheeses, and vegetables), meat and fish, and the star of the show for me, pizzas! Prices are around $14-$20 for entrees and pizzas, and $7-$11 for appetizers and salads. I do love the regular menu but what I really love the most is how they have special weekly menu features and seasonal spotlights on different ingredients! 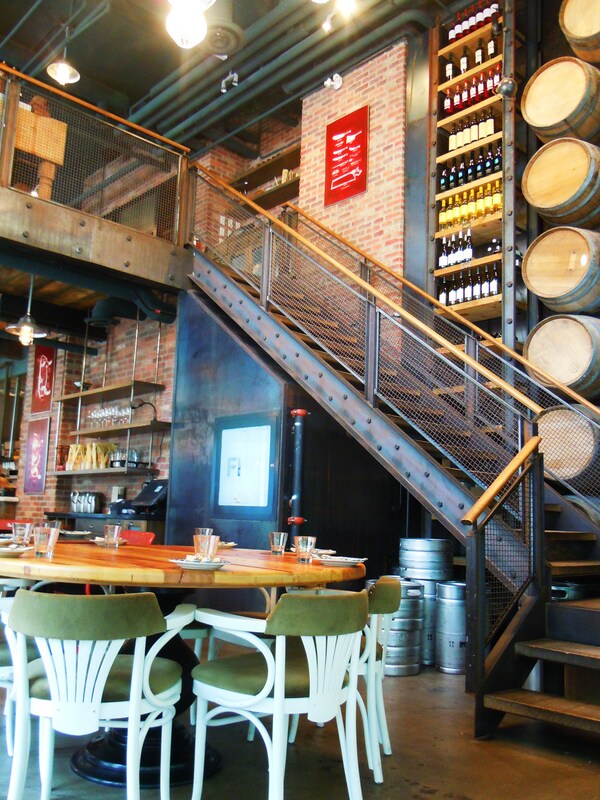 Each and every single week, Mercatto will make a post on their website indicating that week’s features and special menus and/or menu items. Their site keeps everyone up-to-date on seasonal produce and ingredients, new dishes, and news and announcements. I absolutely love checking up on their site once a week, just to see what types of dishes they’ve used special seasonal ingredients for and the approach they’re taking to menu creation. 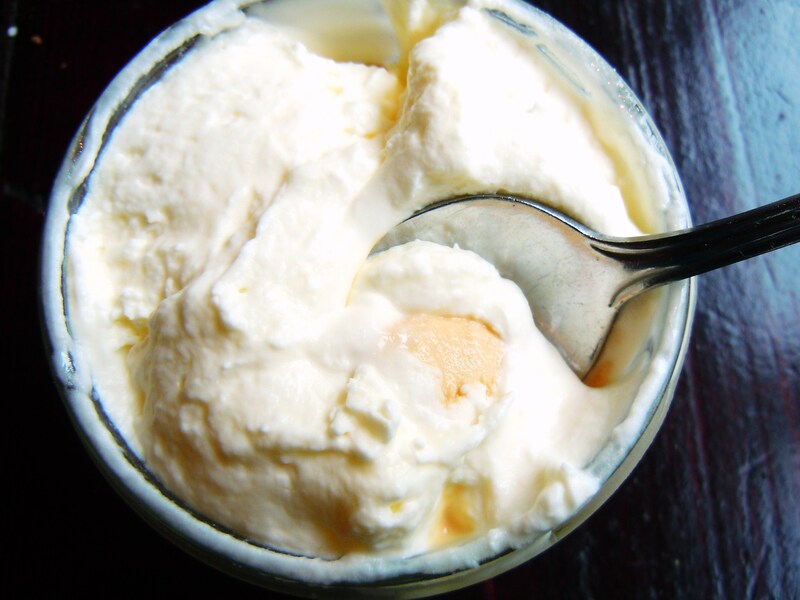 There’s often a special entree and appetizer and sometimes a dessert and there’s always a seasonal focus. For example, one of their weekly specials shined a spotlight on their buffalo meat, used in a pasta bolognese with bufala cheese milked from the same local farm animals. 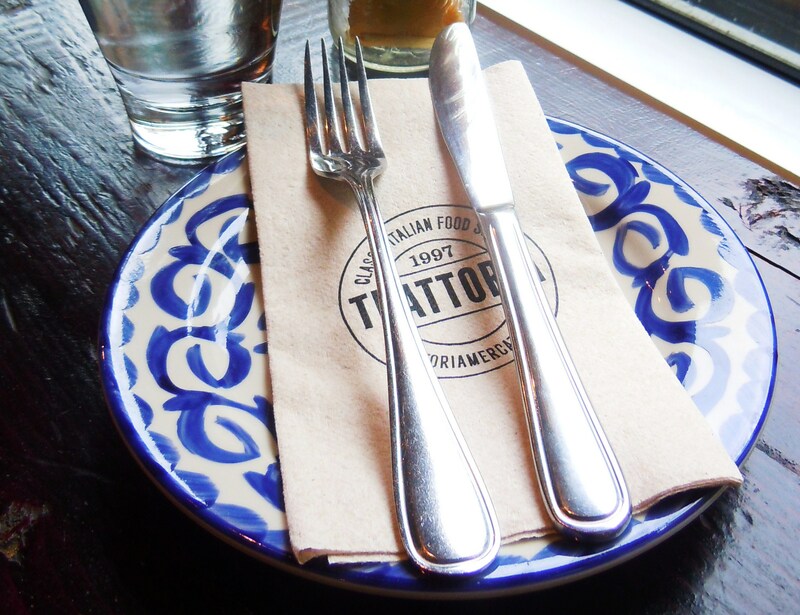 Trattoria Mercatto at the Eaton Cente is also lovely to dine in. 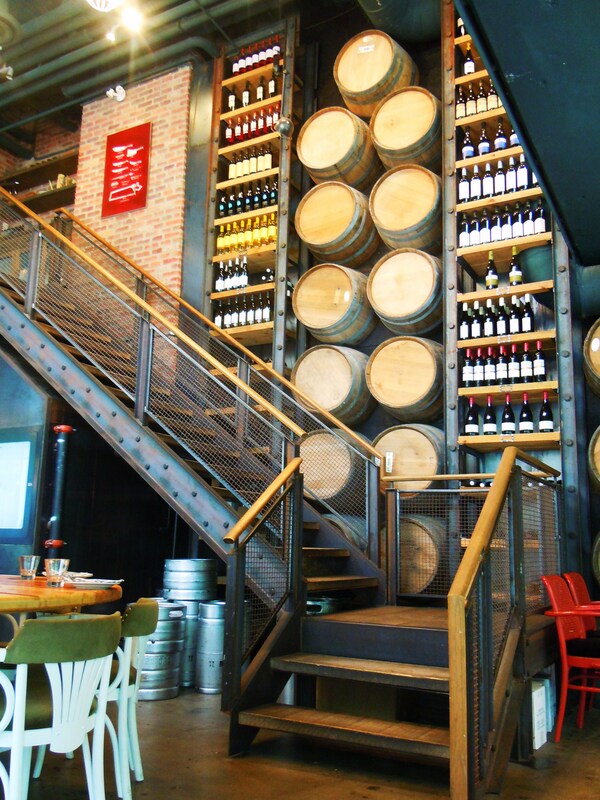 There are bar tables closer to the front entrance and more intimate tables further in, surrounded by barrels and displays of wine and bottles and giant windows overlooking the park and patio. 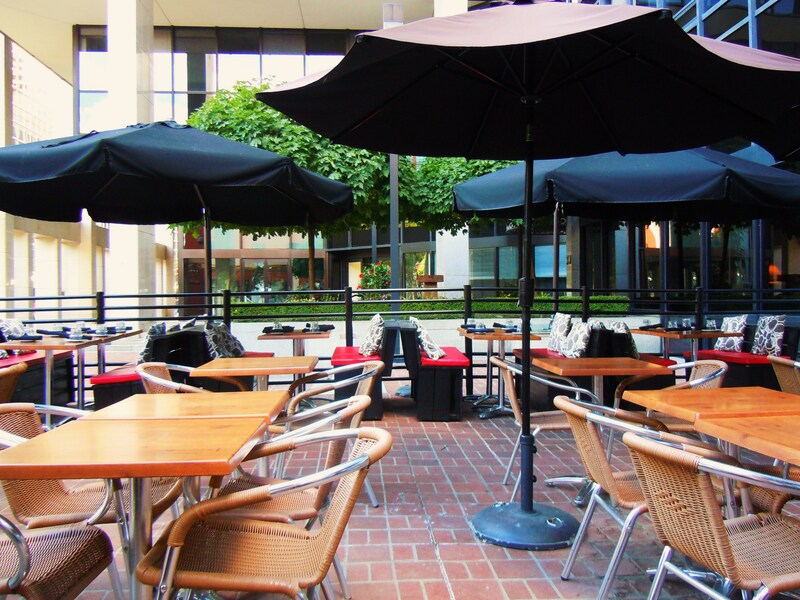 It’s a serene setting that’s perfect for a weekend lunch out, fun group gathering, or a romantic dinner on the town. I love it. And I love their pizza. Their pizza menu features 10 different kinds with lots of differents meats, cheese, and vegetables adorning each one: artichokes, black olives, spicy soppressata (Italian dry salami), cured Italian ham, basil, rapini, eggplant, goat cheese, mushrooms, pancetta, fennel sausage, and so much more. I was debating between one of their paninis and the zucchini pizza ($15.50) and my craving for “dining out” pizza won over so zucchini it was! The pizzas are the perfect size for a great-size meal for a single person (I am not ashamed to say that I polished my pizza off feeling awsome while my best friend, who can pack it in even better than I can, was full to bursting after hers!) and if I had to describe the size, I’d say the circumference is comparable to that of a floppy brimmed hat. My zucchini pizza was bejeweled with grilled zucchini slices, caramelized red onion, smoked ricotta di bufala, tomato, and a huuuuge helping of fresh arugula. I thought I had died and gone to pizza heaven. OH.MY.GOD. This pizza was so unbelivably scrumptious, delicious, and foodgasmic. I kept murmuring, “this is so good!” between bites. I couldn’t believe how amazing it was. 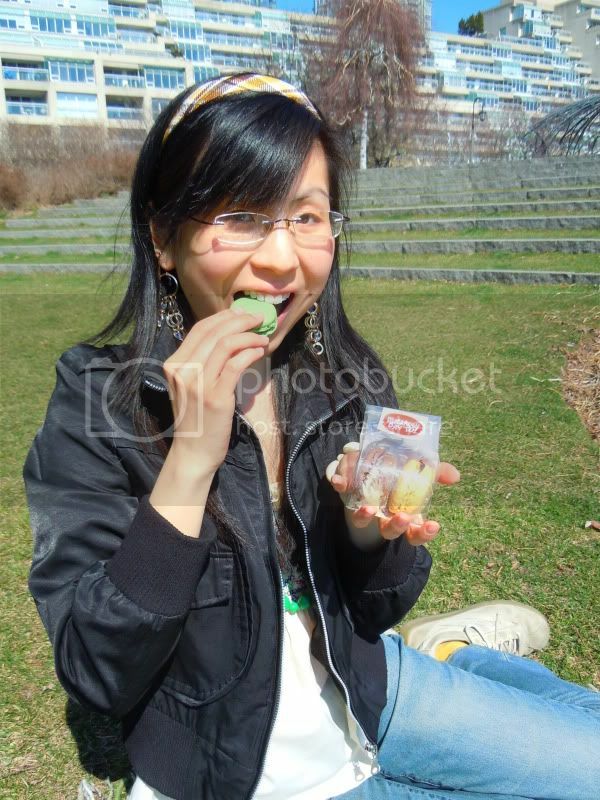 This is “I just want to inhale the whole thing because it’s so delicious” good. Or “I don’t ever want to finish this pizza because I wan’t to savour every bite” good. It wasn’t laden with grease and the ingredients weren’t sparsely sprinkled. It was covered inch to inch and bursting with colour and flavour. 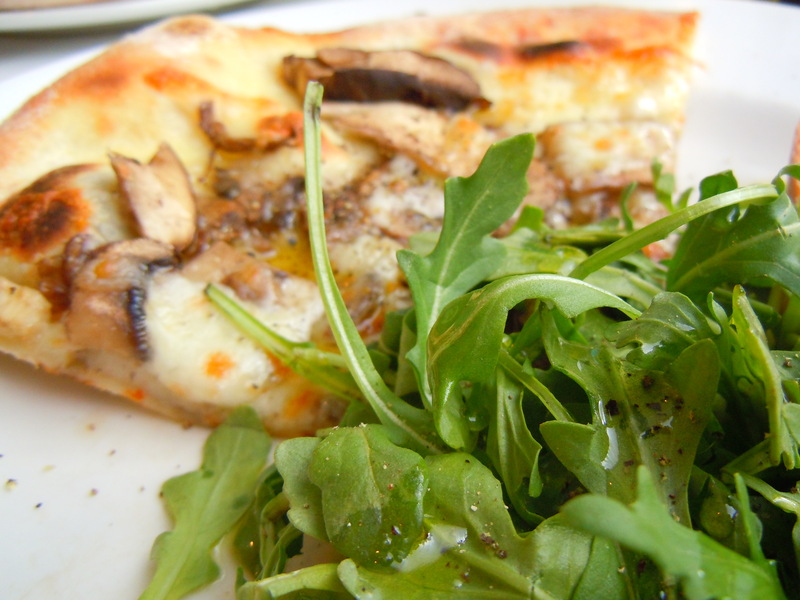 The cheese was warm and creamy, the onions and zucchini were so sweet in flavour, and the arugula? I wish I had a whole extra bowl of it to sprinkle on. What really pushed this pizza over the top for me though was the crust. Let it be known that while I love pizza, I don’t give two cents about the crust. Most of the time, I couldn’t care less about it. I consider it as something that is just part of the pizza and, well, there. It’s never captured my heart because often times it’s too chewy, too tough, too dry, too bland. Their crust? I inhaled it. I didn’t even have second thoughts. No, “hmm, maybe I’ll just leave this part on the side of my plate” or, “hmm, it’s a little tough, meh”. I munched on every morsel of pizza, crust and body, like it was my last time eating awesome pizza. The crust was so crispy, so airy and so darn good. None of those negative aspects I mentioned above even entered this realm. 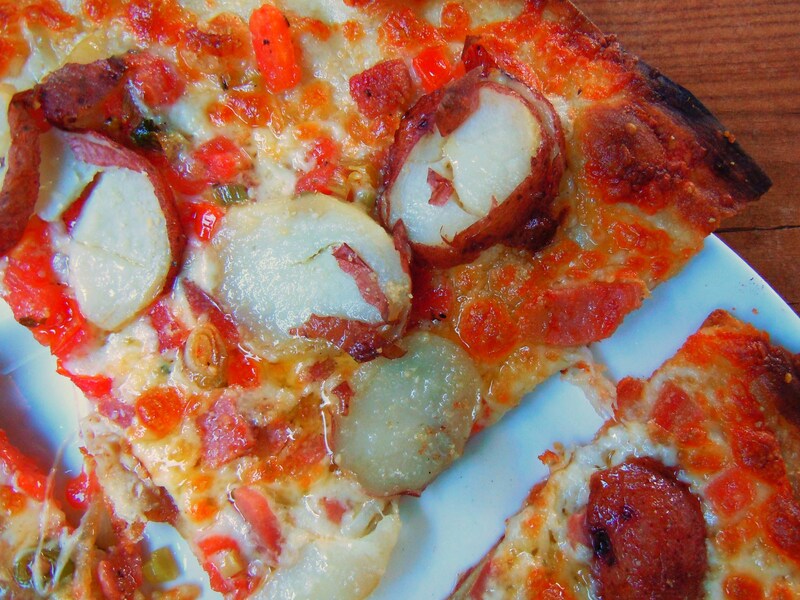 THAT is the true testament of a fab pizza: delicious from top to bottom. And judging how much this experience made and makes me gush, I wouldn’t be surprised if their whole menu was wonderful from top to bottom as well. 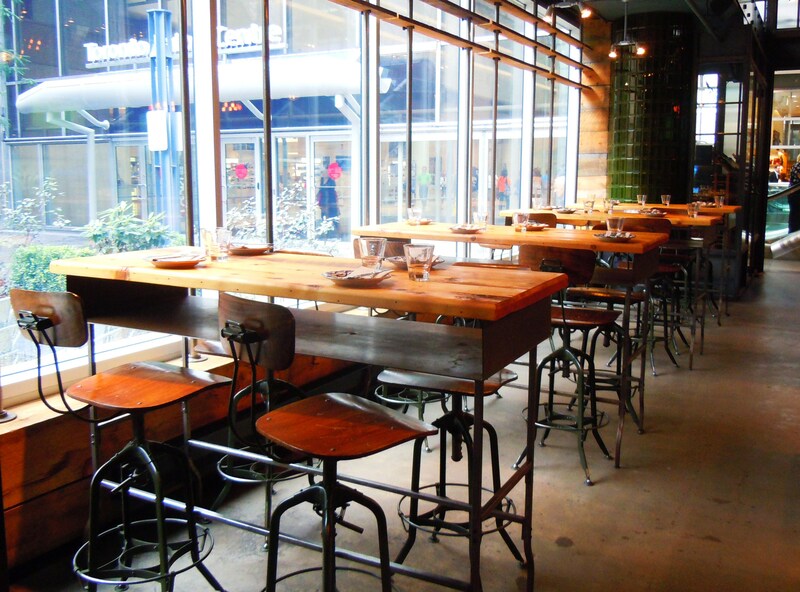 Trattoria Mercatto is located at 220 Yonge Street inside The Eaton Centre on the 3rd floor on the northern, Dundas Street end of the shopping centre. They serve 3 other locations in Toronto under the Mercatto name (Bay & Adelaide, Toronto Street, and the Mars Discovery District on College Street). They are open for both lunch and dinner 7 days a week (Monday-Saturday 11:30am-11pm, Sunday 12pm-9pm at the Eaton Centre location). Click HERE to view their website with menus, upcoming events, catering, news, and more! Stay tuned for tomorrow’s dessert post! 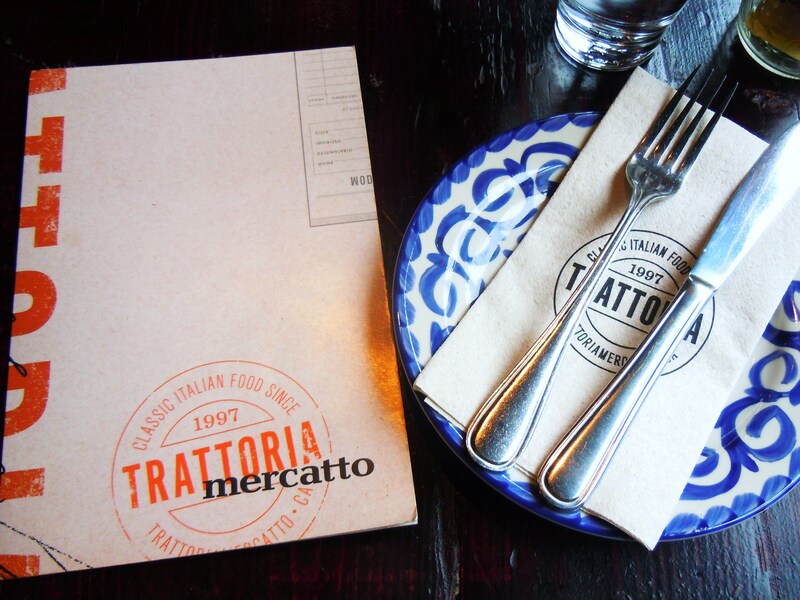 Wine Barrels, Pizza, & Marshmallow-Caramel Desserts – A Photo Spotlight on Eaton Centre’s Trattoria Mercatto, Part I! 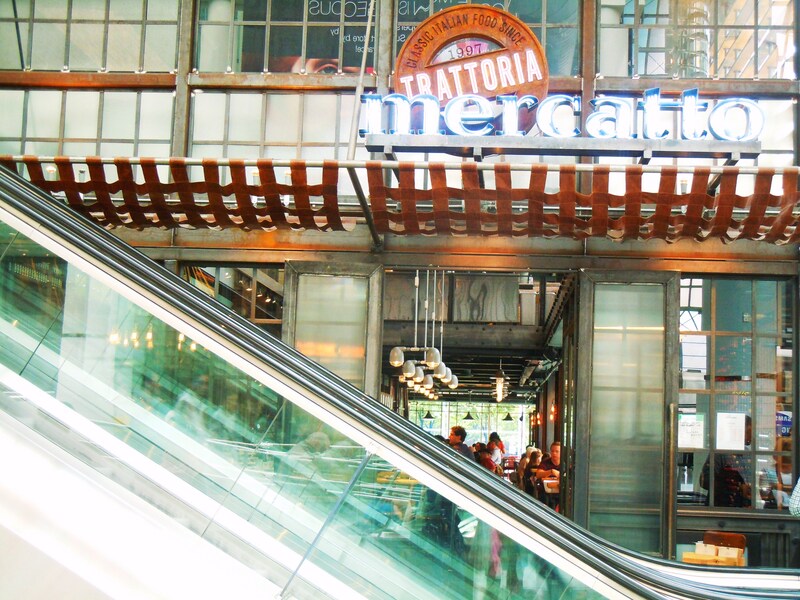 Trattoria Mercatto is located at 220 Yonge Street inside The Eaton Centre on the 3rd floor on the northern, Dundas Street end of the shopping centre. 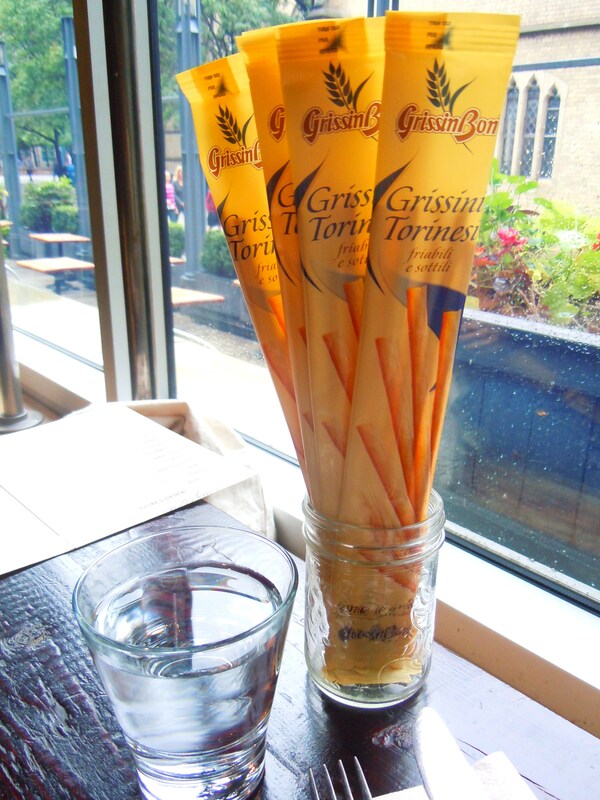 Specializing in Italian fare and seasonal ingredients, their menu features pasta, antipasti, panini, pizza, Italian desserts, and special weekly menus that shine a spotlight on seasonal, local ingredients. They serve 3 other locations in Toronto under the Mercatto name (Bay & Adelaide, Toronto Street, and the Mars Discovery District on College Street). They are open for both lunch and dinner 7 days a week (Monday-Saturday 11:30am-11pm, Sunday 12pm-9pm at the Eaton Centre location). Click HERE to view their website with menus, upcoming events, catering, news, and more! Oh, summer, how I have a love-hate relationship with you. I get to wear pretty, frilly frocks and sandal flats when you’re around and iced drinks taste all the more delicious with you by my side. However, you also make me feel absolutely disgusting with your unbearable heat and don’t even get me started on the bugs you unleash in the wake of your fury. 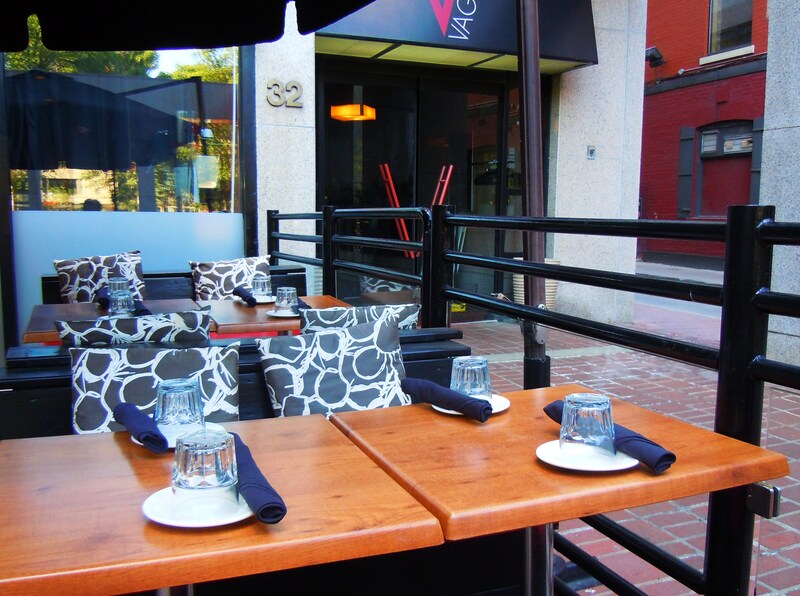 But I can let those things slide – just for a tiny bit – when you hand me nice patios to eat and relax in. 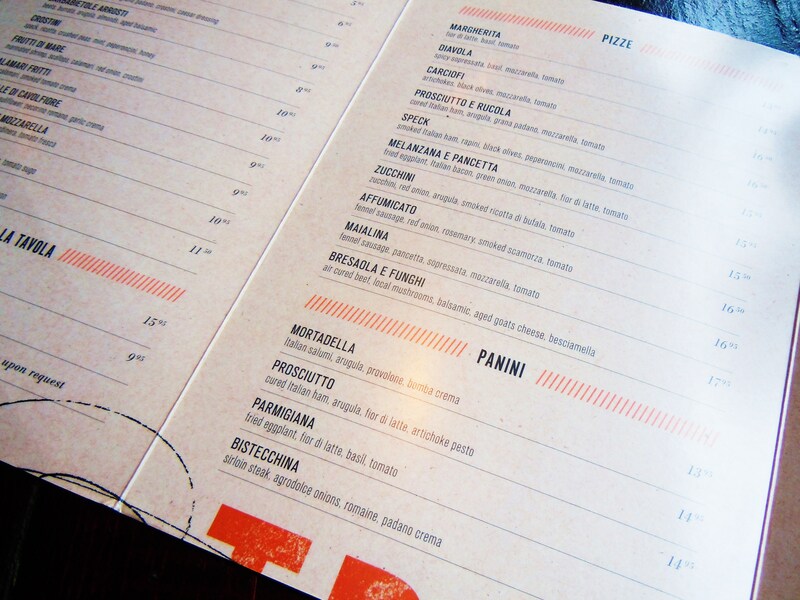 Like Vagabondo on Wellington St. with their fabulous Italian menu and food! Vagabondo and I actually first met a number of years ago for dinner and dessert one summer night, but I didn’t like the photos I took from that meal, so I sadly never wrote about them on here but still thought about how much I enjoyed the food, the atmosphere, and dining experience. I finally made my way back for a follow-up summer meal and I can’t stop raving about it. There are so many things I love about Vagabondo. First off, I adore the patio and the tumbling water fountain out in the front. Any patio that has shade and cover has my vote. Summer evenings and nights are beautiful, but that certainly doesn’t mean I enjoy having the sun shining right in my face or burning the back of my head! Giant umbrellas dot the spacious patio while pretty patterned couch cushions adorn the red and black booths that hug the patio on two sides. And the beautiful water fountain! It’s the first thing you notice the second you pass by Vagabondo on the street and it’s quite captivating. I mean, it’s no Greek sculpture, but there aren’t very many – if any – restaurants in the city that can boast and say they have a monstrous sparkling fountain on or outside their property. 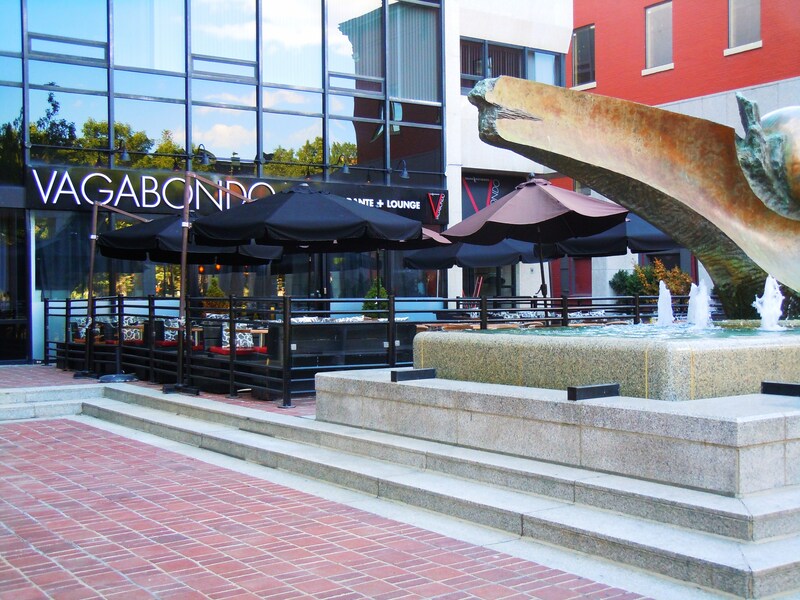 It makes sitting on their dining patio so relaxing and soothing and because of the spaciousness of the restaurant property and patio, it’s almost as if Vagabondo inhabits its own little universe, annexed from the rest of the busy, bustling city. 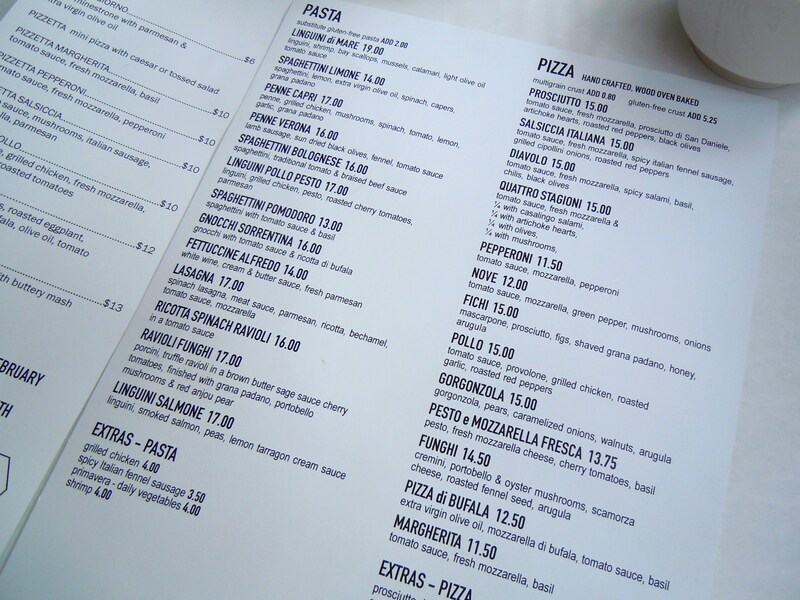 Second, I love how organized their menu is. Sure, many Italian places organize their menus by appetizers (antipasti, salads, and soups), mains, pastas, pizzas (if they serve them), and desserts, but Vagabondo takes it a step further, making incredibly easy for patrons to navigate the menu and to come to a decision on what they want to stuff their face with. Case in point: their main meat entrees are clearly divided and organized by type – one section for chicken mains (pollo), one for lamb and beef (carne), one for veal (vitello), one for fish and seafood (pesce), and another for main dish risottos (risotti). Prices for risottos and meat mains, on average, come in at $20-$28. And their pastas? Divided and organized by sauce: tomato sauce (pomodro), rose (pomodoro cremosa), cream sauce (panna), and olive oil and garlic sauce (aglo’ olio). I cannot tell you how much this makes me bounce off the walls. I love this organizational scheme. Instead of sifting through a list of menu items organized with no particular rhyme or reason, you can just zero in on exactly what your tastebuds feel like! Don’t feel like tomato sauce? Skip it. Have a hankering for risotto? Swoop down to the bottom left of the page. I LOVE THIS WITH A PASSION. Prices for pasta range from $17-$21. 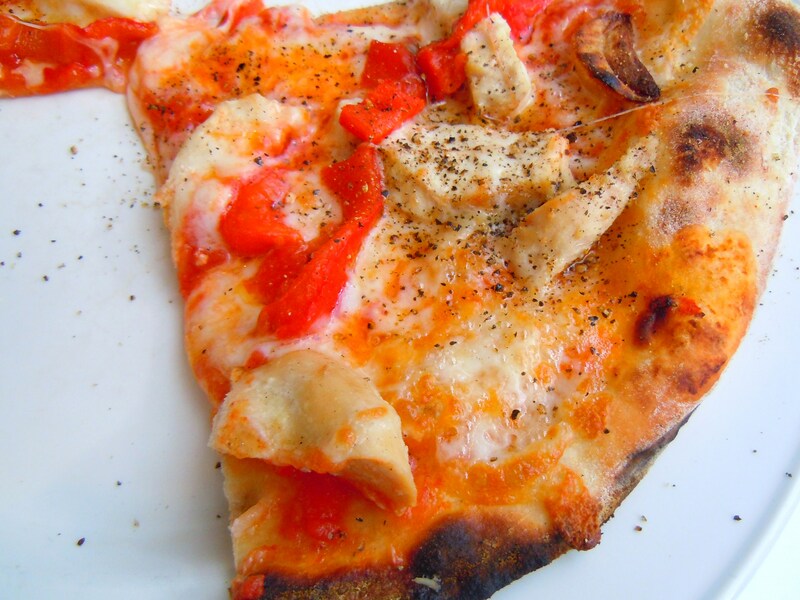 During my first visit to Vagabondo I enjoyed an amazing chicken meal (the pollo porto fino) with fresh steamed vegetables and baby potatoes, and while I desparately wanted to have some pasta, I opted to try one of their pizzas because special Italian pizza is not something I go out for very often. Aside from my yummy price fixe pizza lunch at Il Fornello, it’s been pretty dry in that department. So I watered the grass, so to speak. 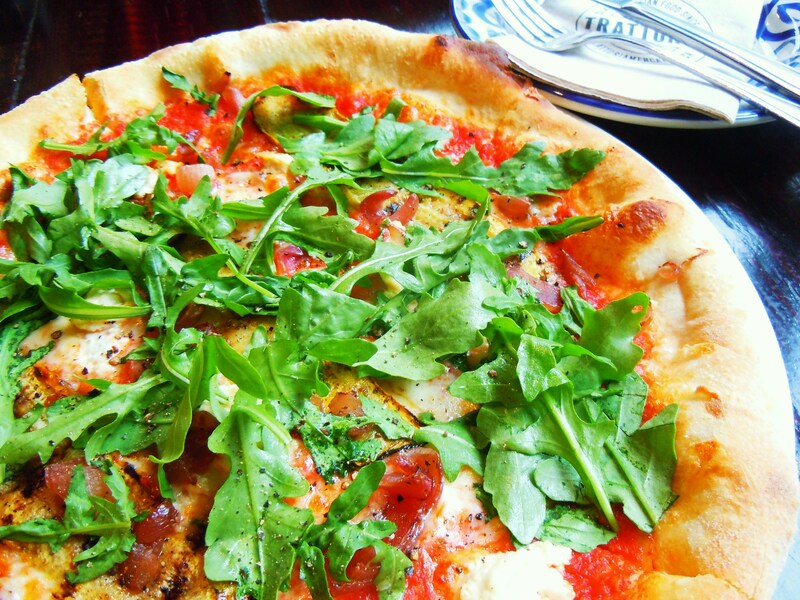 Vagabondo has 12 different pizzas to choose from (with most priced from $15-$17) and if you’re vegetarian, it’s probably not the best thing for you to go for on the menu as most pizzas have a mix of both vegetables and meat. Toppings include artichokes, proscuitto, goat cheese, zucchini, eggplant, peppers, baby spinach, chicken strips, sundried tomatoes, feta cheese, mascarpone cheese, sausage, portobellos, and so much more. My pick? The Pizza Bianca: white pizza brushed with olive oil and topped with mozzarella cheese, bruschetta, pancetta (why, hello, Italian bacon! ), Parmigiano Reggiano, and – wait for this – sliced baby potatoes! 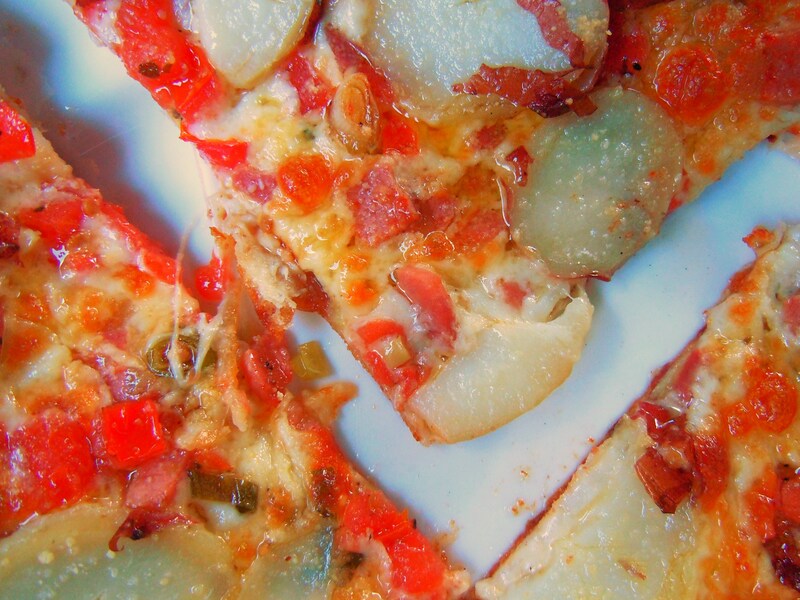 I don’t know about you, but I have fallen so deeply in love with potato pizza. 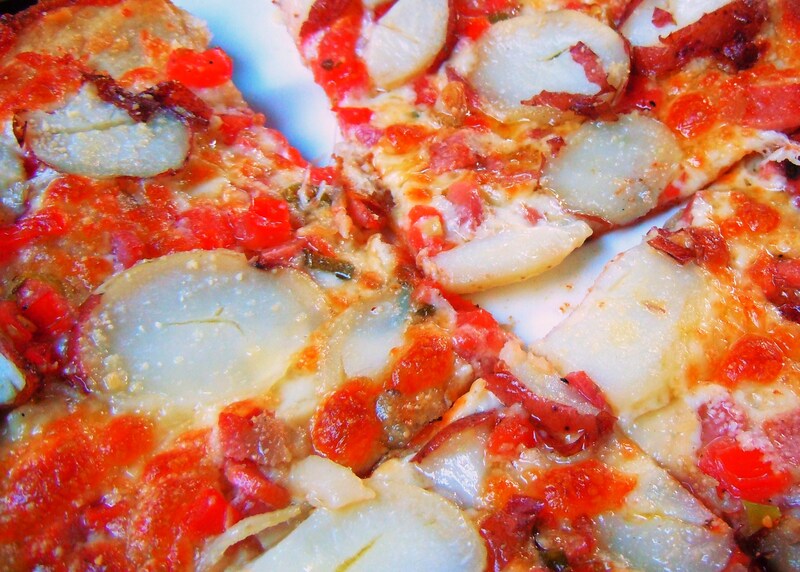 I never had potato pizza until Linda, momma dolce to Le Dolci’s icing sugar queen and head honcho, Lisa, brought some for us for lunch when I was cupcaking it up during my time at the studio. Before that I had never heard of potato pizza but after that first bite I was hooked. 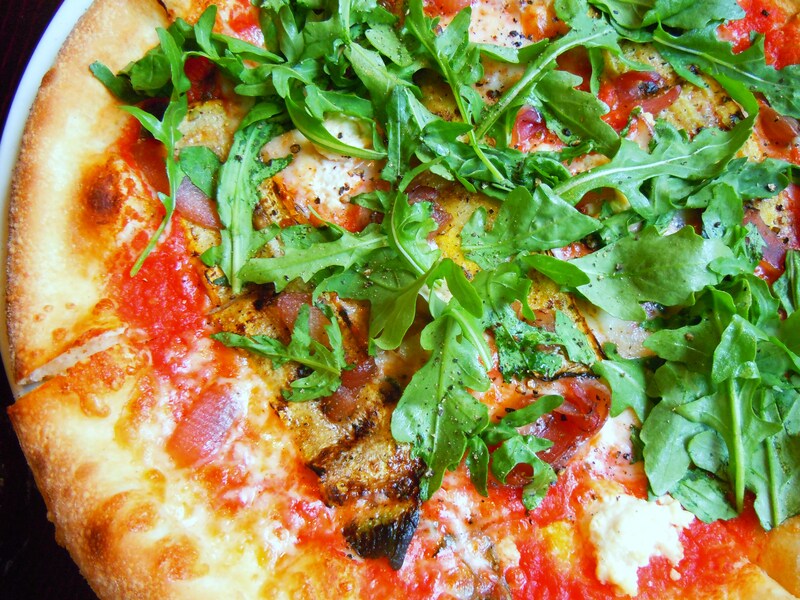 Vagabondo’s pizza is DELICIOUS. It’s a nice big pie on a round metal pizza platter, cut into quarters, and served with red chili flakes in a shaker. All the flavours and textures worked beautifully together: the bruschetta gave it freshness, juiciness, and a bit of acidity, the pancetta made it smoky and crispy, the olive oil and mozzarella cheese were foodgasmic together, and the baby potatoes were just divine. 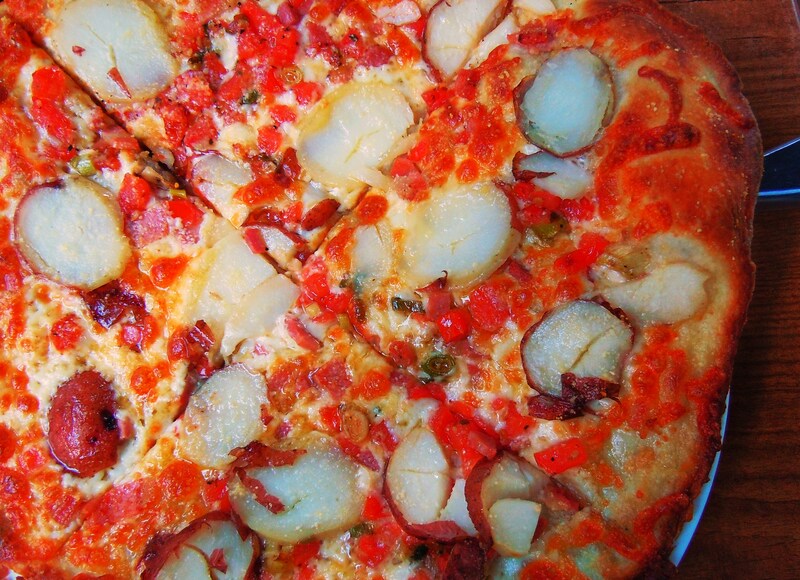 They were sliced into big round coins and the potatoes just absorbed all the flavours while at the same time giving the pizza body and starchy texture. The pizzas are thin crust and so flavourful and the added kick from the red chili flakes made it taste that much more amazing, not to mention there’s plenty of cheese to go around! I love my pizzas extra cheesy and boy did this pizza ever deliver in all aspects of flavour, ingredients, and yumminess. 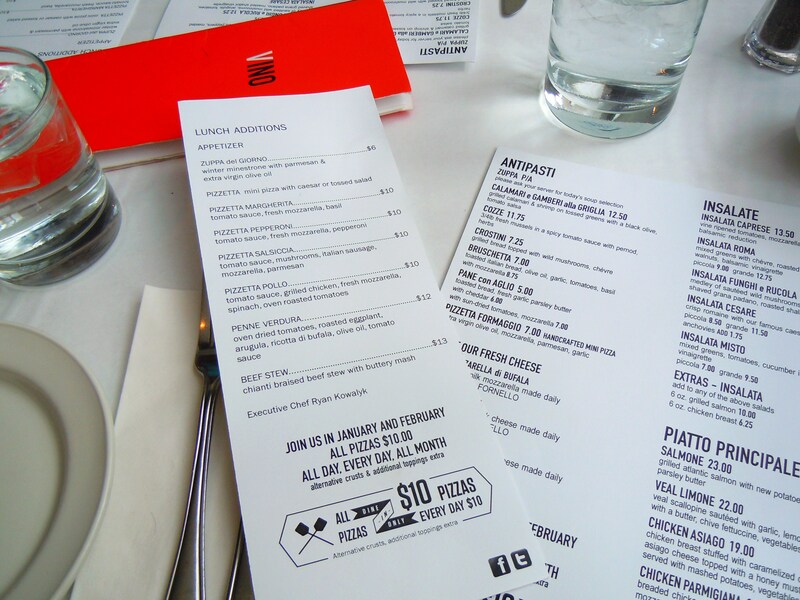 Even if you’re not in the mood to splurge a little more on an Italian dinner, Vagabondo has an express lunch menu with panini sandwiches, pizzas, and similar items to the ones on their dinner menu but in lunch-size portions and with less expensive prices, so it’s win-win for everyone. It’s one of my favourite spots in the downtown core and I can’t wait to come back and try some pasta, risotto, and dessert! 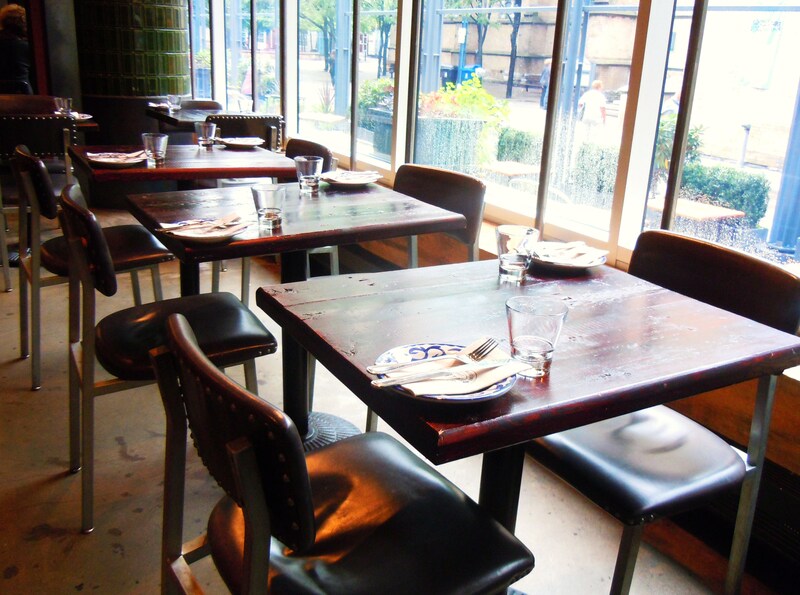 Vagabondo Italin Ristorate and Lounge is located at 32 Wellingto Street East in the St. Lawrence neighbourhood between Yonge and Church Street. They are open 7 days a week for both lunch and dinner, and they offer a lunch express menu as well as take-out. You can view their website and menus HERE. 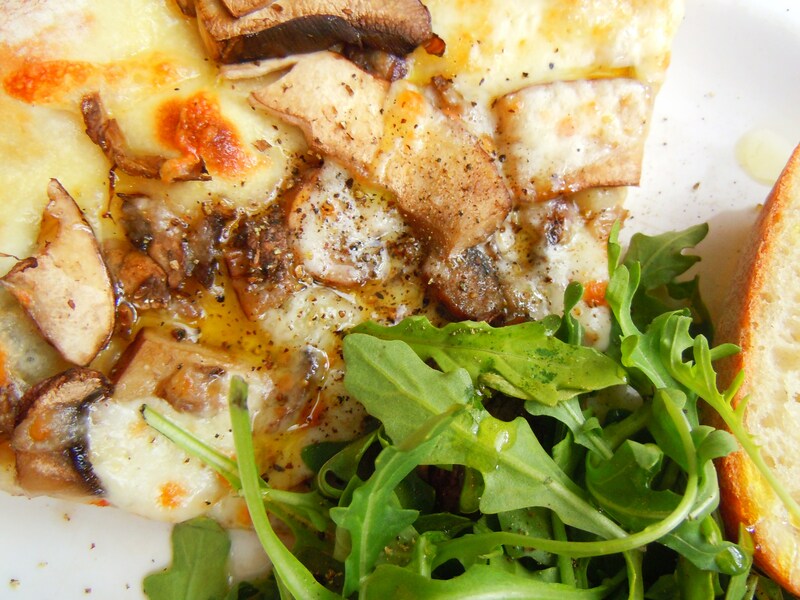 Portobellos, Creminis, Arugula, Scamorza Cheese & More – The Funghi Pizza & Pizza Price Fixe at Il Fornello! Pizza has made its way to Ate by Ate! After 400+ posts, the great big pizza pie is finally getting some serious love and attention! I love pizza (I only know of 2 or 3 people who actually don’t – the horror!) but you know how it is: ordering pizza from your local pizzeria takeout joint and having your hot and fresh pizza out of the cardboard box doesn’t really make for the most stellar photography. 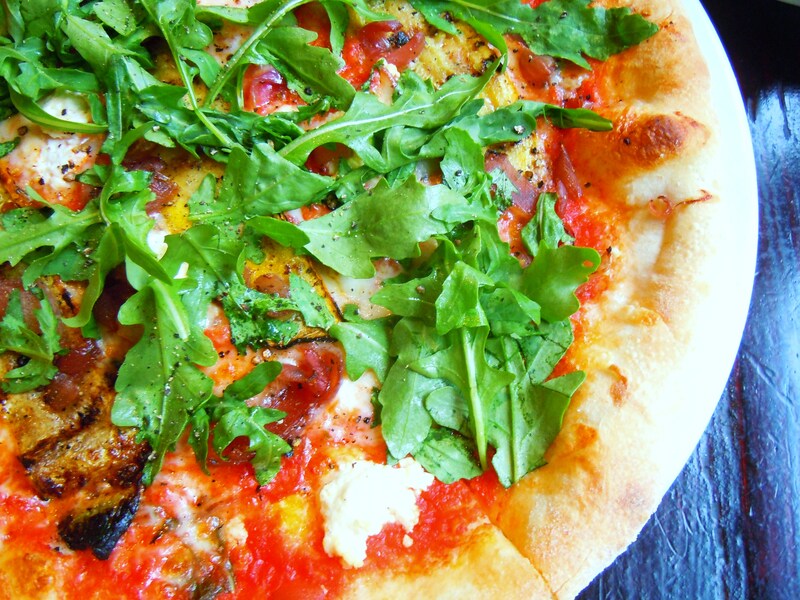 Unless you’re out to wine and dine, pizza is generally consumed in the comforts of your school cafeteria, elementary school day pizza day lunches, at home in your PJs in front of the tv, or among friends at a movie and games night pizza party. 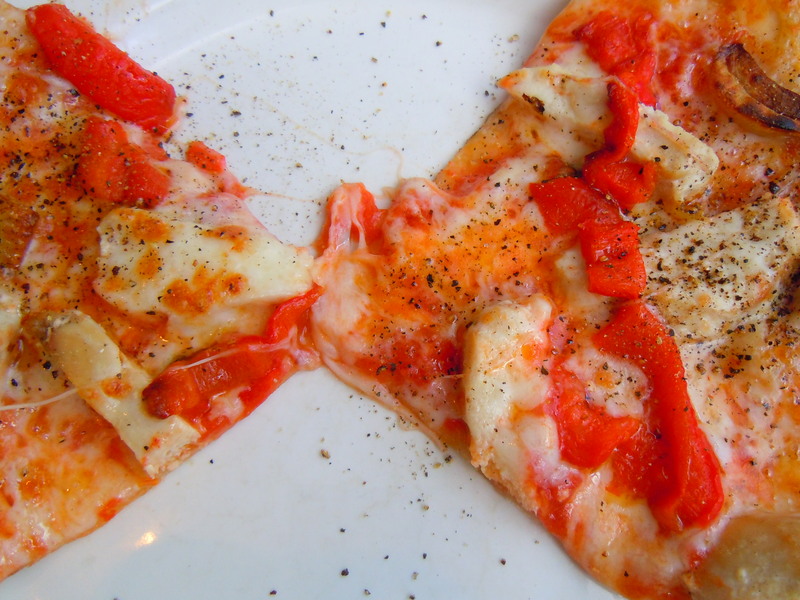 Pizza is one of those foods that I just don’t order when I’m dining out and it’s not because I don’t want to. I definitely do, but I have to be honest, the prices are a deterrent. I know the ingredients and toppings are and can be stellar, but when a pie meant for an individual person costs $16, I cringe. There are many pizzas around the city I’d love to try, and maybe I will someday, but for now I’d much rather either make my own (making pizza dough and my own pizza creation is something I’ve always wanted to try! ), or else it’s something I have to think long and hard about if it isn’t the variety delivered in a cardboard box. Enter Il Fornello. 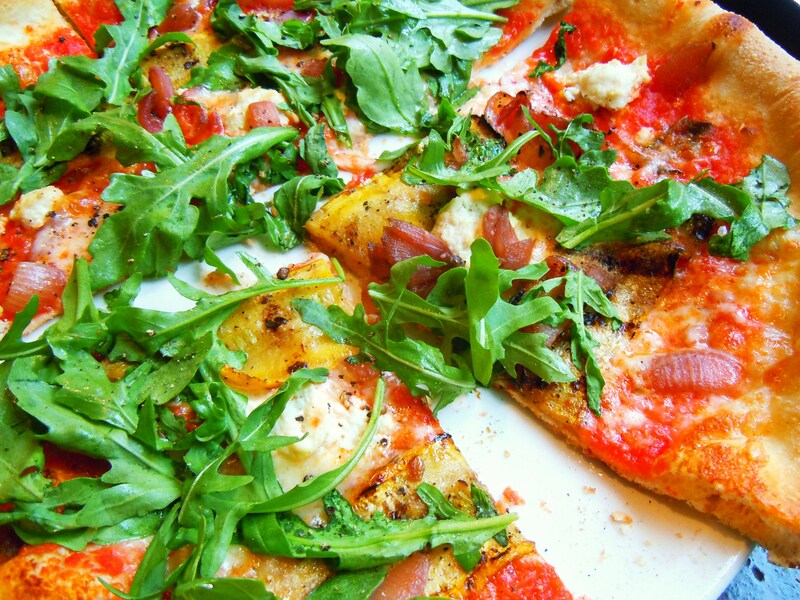 This Italian eatery serves up a menu of linguine, spaghettini, ricotta ravioli, gnocchi, antipasti, appetizers, and salads (insalata) with fresh mozzarella and ricotta di bufala, veal fettucine, chicken parmigiana, and a host of wood-fired, thin crust pizzas. The menu is comprised of so many foods I love. Pasta? Check. Fresh mozzarella? Check. Pizza? Check, check, and check! And yet it has taken me so long to sit down to a meal here! It’s not the type of place my family would necessarily go to (remember, my dad does not feel the love for pasta) and for whatever reason, the opportunity to enjoy a meal here has evaded me all this time. Today is the last day of Winterlicious here in the city and my Twitter feed has been blowing up with accounts of delicious dinners, great wine, and memorable meals. There’s been a slight change of plans here on the blog though. Remember how I excitedly announced I would have two special Winterlicious posts in my “Bring on the Winterlicious Countdown!” post back in January? Sadly, my two Winterlicious feasts didn’t happen; just the one. I had my fabulous lunch of citrus cured salmon gravlax, smoked turkey and brie panini with strawberry and basil with red pepper jam, and a to-die-for lemon basil crème brûlée at Cafe Nicole at the Novotel hotel on The Esplanade downtown. I had every intention of doing my 2nd Winterlicious lunch, but my other half of a sweetheart came down with a bad case of the winter cold complete with fever, chills, and coughing, and I didn’t have the heart to go without him. So, I don’t have a 2nd Winterlicious to share with you all, but I do, however, have another price fixe event to be really excited about! This is a photo teaser post of my upcoming Il Fornello pizza price fixe write-up and I am bouncing off the walls because 1) I’ve been wanting to eat at Il Fornello’s for the longest time and now I finally have!, 2) I almost never go out for pizza dining, and 3) this is technically the first post on the blog devoted to pizza so that makes this an extra special occasion. Several Il Fornello locations around the city are holding this fabulous pizza price fixe event where ALL of their pizzas are priced at $10 EVERY day, ALL day until the end of February and I’m here to deliver the goods! Il Fornello at Yonge & St. Clair is located at 1560 Yonge Street, north of St. Clair Ave. at the corner of Yonge and Delisle. This location is open for lunch and dinner from Monday-Friday at 11:30am and on the weekends, only for dinner (5pm on Saturday and 4pm on Sunday). 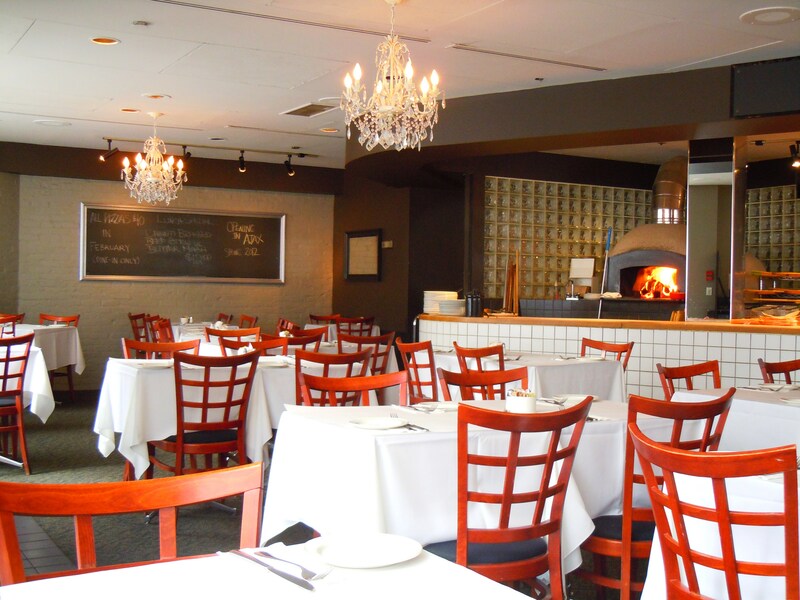 Il Fornello’s pizza price fixe event will be in effect until the end of February. 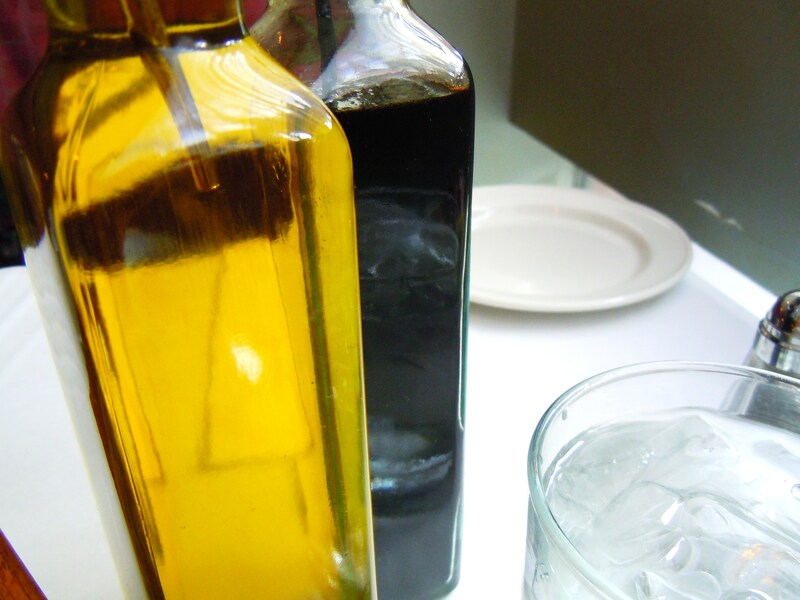 The Italian eatery has a number of locations in and around Toronto and the GTA. Their menu, locations, and promotions can be viewed on their website here.